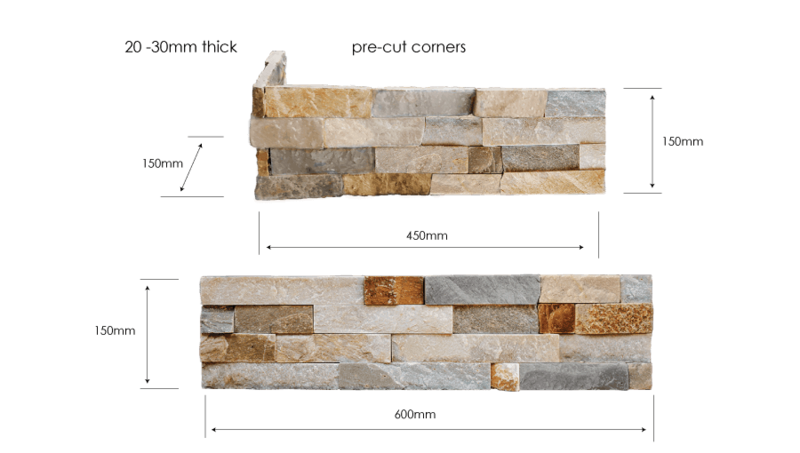 Benjamin is a stone veneer with beautiful colours throughout, it is easy on the eyes and can create exceptional spaces and features. Stacked stone walling is a cost-effective way to dress any wall. Installation is quick and easy. The panels we offer are straight panels in a convenient size of 600x150mm, which can simply be glued onto the wall like tiles. We also have matching ‘L’ shaped corner pieces in a range of different sizes to make your job even easier. Benjamin Quartz Stacked Stone has a multicolour variation which makes it a great feature on columns and piers, front entrance-ways and pool feature walls.